Habit: Perennial herb, occasionally flowering 1st year, 1--10(15) dm. Stem: (0.2)2--5 dm, glabrous, occasionally hairy at base, generally inflated. Leaf: basal; blades (0.5)1--2.5(3) cm, +- round, (0.5)1--2(2.5) cm wide, short-hairy. Inflorescence: 5--70 cm, 5--50 cm wide; branches occasionally inflated, glabrous; peduncles erect, 0.5--2(3.5) cm, straight, generally thread-like, glabrous; involucres 1--1.5 mm, 1--1.8 mm, glabrous. Flower: (1)2--3(4) mm, hairy; perianth yellow, lobes generally ovate. Fruit: light 2--2.5 mm, glabrous. Chromosomes: n=16. Unabridged Note: Degree of stem inflation correlated positively with available moisture, possibly positively with CO2 accumulation, and not correlated with insect activity (despite ongoing reports to the contrary). 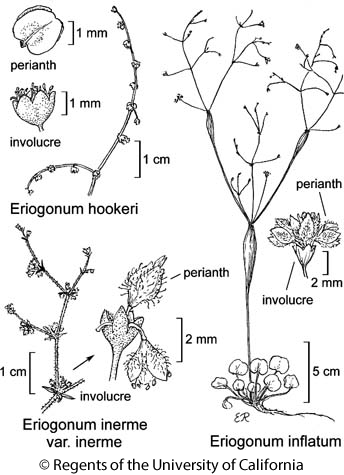 Citation for this treatment: James L. Reveal & Thomas J. Rosatti 2012, Eriogonum inflatum, in Jepson Flora Project (eds.) Jepson eFlora, http://ucjeps.berkeley.edu/eflora/eflora_display.php?tid=24811, accessed on April 19, 2019.